Check out Lello Cacace’s testimonial about his Magnum 44′, 27′, and 53′! It is a real pleasure for me to testify my appreciation and affection for Magnum Marine. In 1977 I was a young boy when my father purchased the first Magnum 53′. I can say that, in every sense, I grew up on and with Magnums. So it was only natural that, as my first boat, I chose a Magnum 27′. I remember with great fondness the mythical Like Lightning which brought so many moments of pure joy, the sense of great freedom without worries of my twenties. At the same time, I remember the great sense of reliability and seaworthiness of the boat: in spite of the speed and performance, she was as safe as all the larger Magnums. 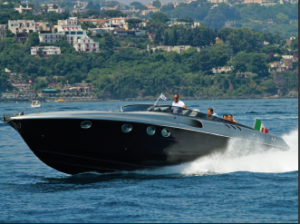 Even today, the 27’ is a modern boat, and I enjoy seeing her speed like an arrow in the Gulf of Naples. My requirements changed with time, and from the Magnum 27′ I passed to a Magnum 44′, so as to have more space and comfort without giving up acceleration and sportiness. The speed and performance gives me great pleasure when I am at the helm of my 44’. I am very proud of my Magnum; I thank all those at Magnum Marine and pass on a message of infectious appreciation to Filippo without whom we may never have known this passion.